I’ve written before about a poster presented by AncestryDNA at the American Society of Human Genetics 2013 annual meeting, entitled “Reconstruction of Ancestral Human Genomes from Genome-Wide DNA Matches.” In the abstract, the group describes how they use sequencing information from hundreds of descendants of an 18th century couple to recreate portions of the genomes of that couple. Title: Reconstruction of ancestral human haplotypes using genetic and genealogical data. I sure would be interested to learn more about the “amount of the genome that can theoretically be reconstructed given the number of generations back to the ancestor and the number of actual and sampled descendants.” Is there some critical mass of descendants required? How many generations back is too many? Is there an optimal ancestor range for reconstruction? And, how good/accurate/complete does the paper genealogy have to be in order for this method to be utilized? And, not surprisingly, they’ve started to infer information about “select physical features.” I’m guessing that includes the easy ones like eye color and hair color. It would be interesting if they could reconstruct an ancestral couple from the 18th century for which there is information about their physical appearance (a painting or written description, for example), and see how well the genomic information aligns with the historical information. So why is this interesting? Well, reconstructed genomes can be very useful for genealogy. First, they can tell us about our ancestor, including physical traits (predicted eye color, disease propensity, etc.). Second, they can be used to recreate family trees. For example, once segments of DNA are assigned to an ancestral couple, those DNA segments can serve as “flags” for future individuals that have the segments but don’t have an established paper trail back to that ancestral couple. And there are many more possible applications of this technology. It’s frustrating to see that Ancestry is doing this interesting work with the data from our DNA tests, but keeps that data to itself. If they can’t figure out how to present it to us, they should pay GEDmatch for a license to their software. I’d love to have access to it now, but this is in the very early basic research stage and not at all ready for any sort of launch. There is no question that this will eventually work its way into a commercial product, hopefully as a tool at AncestryDNA and other services. I’m more than happy to let AncestryDNA and whoever else wants to use my DNA in order to develop genetic genealogy tools! That’s one of the reasons I and others joined the Personal Genome Project as well. 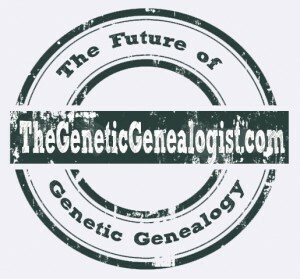 And, of course, there’s nothing stopping amateur genetic genealogists from doing reconstruction. Indeed, Felix at http://www.y-str.org has a tool called “Pirate DNA” that does some reconstruction. It would be enough for now if Ancestry just gave us the match data by chromosome — I’d put it in the spreadsheet myself. Most of the people on Ancestry don’t want to go to the trouble of taking their raw data and putting it into GEDmatch. The company says they have a super solution just around the corner, but we’ve been waiting a long, long time, and so far it’s been just vague promises. Pirate DNA looks like an interesting tool, but only works with your matches on FF or GEDmatch at the moment. If Ancestry were to release the segment match data, I would expect Felix could adapt to that in a short time. If AncestryDNA can’t show me my matching segment data, maybe they shouldn’t be allowed to keep it. Right now I have several thousand possible matches on Ancestry and to be honest, not a single match that come anywhere close to meeting genealogical proof standard. To add to the confusion, I tested very early, so my “matches” are based on base-pairs rather than cMs. I wish they would provide basic chromosome evaluation tools rather than muck about with their so called “better mouse trap”. I notice most of my new matches have no trees or very small trees. I wonder how soon Ancestry will run out of new customers and give up on DNA testing all together? I agree, it’s tough in these early days of genetic genealogy to find the common ancestor with anyone but very close relatives. I think it’s possible, but few of us have the time to devote to doing so. The lack of trees is one of my biggest complaints with my fellow test-takers – if you don’t have a tree up, why bother?? Getting people to test is just the tip of the iceberg. If you read through my Future of Genetic Genealogy posts, you’ll see how the results from DNA testing will continue to be combined with traditional records and family trees to yield incredibly powerful tools that far outweigh the value of a list of genetic matches. I come from a population which has given me a lot of double 4th cousins and similar DNA links. I have no idea what to do with most of my results. I try to get people on GEDmatch, but I rarely succeed. The successes are delightful, but they also make me see how much I’m missing. I know genetic genealogy is inherently difficult, but I don’t understand the point of selling DNA tests if genetic genealogy is too challenging or time consuming for most prospective customers. To me, it looks like too many AncestryDNA customers are engaged in a kind of circular logic in which prior assumptions are being used to reinforce prior assumptions on the basis of unspecified quantities of matching DNA. I feel like the science is being misused, and in the long run that threatens the credibility of genetic genealogy. The Ethnicity Estimate is fun, but it doesn’t closely match Ancestry Composition at 23andMe or FTDNA’s myOrigins, so I don’t put a lot of stock in it. It’s really not much more than a flimsy conversation piece. I’m having a hard time understanding what happy AncestryDNA customers are happy about. Maybe they simply have too much confidence in the shaky leaf hints. I feel like I’m dumping criticism on AncestryDNA all the time, but I just want them to do better. I’d rather be singing their praises.